When it comes to owning a hot tub or Jacuzzi, it is important to understand how different chemicals can affect the water. With that in mind, we’ve created this guide to explain how to use and get the most from your Outdoor Living & Jacuzzi chemicals. While hot tubs are treated in a similar way to swimming pools; there are some challenges involved with maintaining the quality of a smaller volume of water. Because of this, it is crucial that anyone responsible for the quality control of hot tub water understands the chemicals they’re using. As hot tub water is warm, its chemical balance is constantly changing and the measured application of water balance chemicals will keep your hot tub water clean and free from harmful bacteria for longer. That is why hot tub owners must ensure they monitor for any changes in the chemical balance of the water and act appropriately. What is a hot tub sanitiser? A sanitiser is a disinfectant chemical used to kill bacteria that evolves within hot tub water, keeping it safe for bathers. There are two popular sanitisers used to protect the water within hot tubs, which are chlorine (the stronger of the two) and bromine and are available as granules & tablets. If you’re a hot tub owner with sensitive skin, then the use of bromine or even oxygen, a less popular sanitiser, are recommended. For more detailed information about sanitisers, we have a chlorine guide, a bromine guide and an oxygen guide available. The amount of a chemical used in hot tubs is usually measured in ppm (parts per million) or mg/l (milligrams per litre). 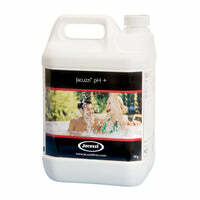 In hot tubs it is essential to keep the amount of Chlorine at between 3-5ppm. The pH scale works from 0-14 with 7 being neutral, anything below 7 is classed as acidic while anything above 7 is considered an alkaline. For hot tubs, the term pH is a scientific way of describing whether your water is acidic or alkaline with the ideal pH for hot tub water is between 7.2 - 7.6 with large variations outside this range, either way, can have detrimental effects. 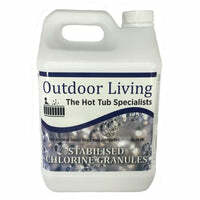 We sell all the chemicals you would need to help balance your hot tubs pH levels. Want to know more? Read our guide - How to balance your hot tub pH level. 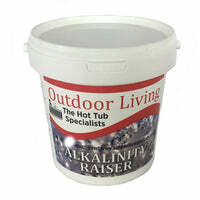 We find a lot of people confuse a hot tubs pH level and the total alkalinity. Alkalinity refers to the amount of alkaline salt affecting the balance of your hot tub water, which will also affect the water hardness. To raise the alkalinity level in your hot tub, use sodium bicarbonate over time until it is between 80 – 120 ppm, if the alkalinity level is too high, Jacuzzi Direct recommend using a pH reducer. The alkalinity level in a hot tub acts as a buffer for the pH level, which would be impossible to balance without first getting right. Total hardness refers to the levels of calcium salts which are affecting the balance of water in your hot tub and determines how corrosive or scaling the hot tub water is. If the water in your Hot Tub hits a state of “total hardness” you will notice scale around the shell of your hot tub and cloudy water. If the hardness level of your hot tub is too low it will force the water to draw from other minerals such as aluminium, copper and iron which can damage parts of your hot tub that are built from these materials. You should ensure your hot tubs calcium reading is between 100 – 250PPM. If the levels of calcium hardness in your water are above this, we advise using Jacuzzi a no scale product which is designed to keep calcium from solidifing on the shell and internal hot tub parts. Without getting into the chemistry of it there are four main reasons you need to shock your hot tub water with either chlorine or non chlorine shock. Firstly it can be used to remove organic compounds after heavy use. A great example is to treat cloudy water. The second is to kill bacteria. This is only applicable if you use a chlorine shock treatment. Another is to create more 'free' chlorine and bromine. As your sanitiser works it 'sticks' to bacteria in the hot tub which means it can no longer be 'active' to remove any more. A weekly shock treatment will remove bromamines or chloramines so they can be caught by the filter. Finally it reactivates bromides so that they work more affectively to kill the bacteria. Hot tub shock is a procedure carried out to quickly deal with water problems in your hot tub by raising the levels of sanitisation. It would generally be carried out if the hot tub has not been used for a long period of time or has had heavy usage. If you need more detailed information, read our guide – How to shock your hot tub. For more hot tub and Jacuzzi guides, check out our Hot Tub Inspiration & Advice Centre today. The alkalinity is often high – how do i lower this? What precautions do we have to take with the chemicals when disposing of the water. Most good quality tubs come with a chemical test kit nowadays. If it doesn’t, you can but them very cheaply online. It takes a bit of homework to get it right. Use online videos to see what the correct method is for getting the chemical balance correct. It’s not that difficult once you know what you are doing. Great article – keep up the good work. You can test the calcium hardness in your hot tub water with specific test strips. This is not a product that we supply due to lack of demand however you can purchase the test strips online through Amazon from a company called Simplex. How do I test the calcium hardness levels in my hot tub please?